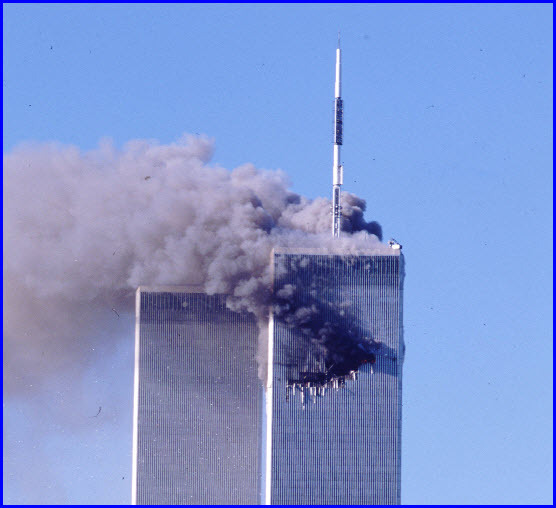 First Tower Hit – September 11, 2001! | Chaos Sweeps Away the World We Know! The Disaster, current events & Catastrophe Blog. Forecasts for 2014 to 2022. Read tomorrows news today! Plus current economic, commodities, stock indices and financial news. First Tower Hit – September 11, 2001! One of the most startling and long remembered airplane disasters was the attack on the twin towers of the World Trade Center on September 11, 2001! A day that will surely live in infamy, much like the sneak attach on Pearl Harbor; some 60 years before. Within two hours, both towers would collapse and the world would never be the same. The first plane hit at 8:46 A.M. and 40 seconds on a cobalt blue sky in New York City. The astrological chart clearly shows the sudden and unexpected nature of the attack with Uranus (ruling sudden and unexpected events) squaring Admetos (a Uranian hypothetical planet – ruling circular motion) in the 8th house of death. Aries (ruling aggression, action and soldiers) rules the 7th house of war; signifying the start of the war on terror. Zeus (ruling fires and explosions) is hidden in the 12th house of secret enemies. Let us hope that the war on terror does not morph into a war between Christianity and Islam. Another “crusade” is not what this world needs now, however, I fear that is exactly what will and is happening! This entry was posted in Airplane Disasters, Conflicts, Countries, Death, Disasters, Events, Explosions, Fires, Misc, Miscellaneous, United States, War and tagged 9-11-2001, 911, first tower hit, Sept. 11th, twin towers, world trade center. Bookmark the permalink.